This is the opened-door from the acrylic watercolour painting called Alice in Duluxland created in 1989 using a magazine advert as the template. In September 2014 I cropped a copy of my Duluxland illustration leaving just the door. 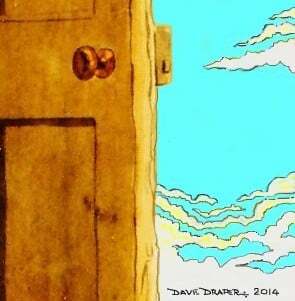 Then I painted a blue skyscape in PhotoStudio seeded with white stratocumulus clouds, peeping in and beckoning you on just beyond the opened-door, like some other dimension waiting to be explored. I created this hybrid of hand-painting and PhotoStudio painting to accompany the short poem, ‘Just a Kind Of Door’, located in Poems in the Writing section.